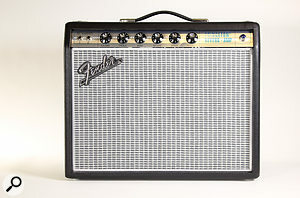 Why do we need a ‘68 model of this classic amp when Fender already have a ‘65 in the range? We tend to select guitar amps to cover in Sound On Sound because they either use new technology or are particularly suitable for recording in a typical project–studio setup. Well, this one uses unashamedly old technology, albeit with a bit of a twist, but it certainly scores very heavily on the latter point. Fender’s Princeton model, the smallest of their dual 6V6–based combos, has been through a number of iterations in its lifetime, but it was the iconic ‘Blackface’ model that Fender chose to recreate as part of their Vintage Reissue Series. The ‘65 Princeton Reverb reissue has gone on to become a best seller that, apart from its PCB–based circuitry, represents quite a faithful recreation of its highly regarded predecessor. So why would they choose to reissue a ‘68 model as well? The 1967/68 period was when the new owners of Fender swept away the classic ‘blackface’ control panels across the range, replacing them with a new and eye–catching silver livery. Many models also received an aluminium trim around the speaker baffle to complete the ‘silver’ overhaul, although this element was soon dropped (you won’t find any of these dating beyond 1969). The amps of the new cosmetic era eventually came to be referred to as ‘silverface’ models, to differentiate them from blackfaces, but the amps of late ’67 and ‘68 and early ’69 make up a unique sub–set known as the ‘drip–edge’ models. The name is derived from the profile of the aluminium angle used to trim the baffle, which looks like roof flashing used to keep rain water away from walls. 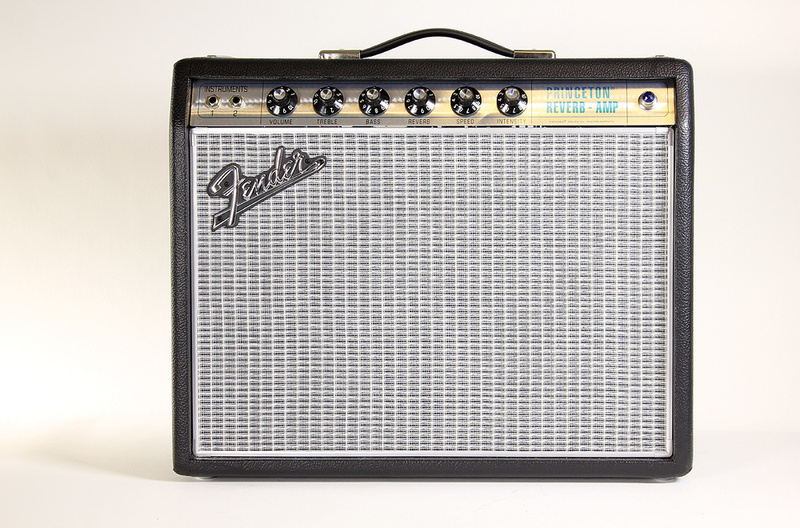 Fender’s reinvention of their amp range also resulted in a number of significant changes to the circuitry, most, if not all, of which are regarded by players as having been detrimental to the performance of the amps. The smaller models, such as the Deluxe and Princeton, however, came through this round of changes almost entirely unscathed, so an early ‘silverface’ is often very close to being a blackface with different cosmetics. Where, then, does that leave our new ‘68 Custom Princeton Reverb? The clue is in the word ‘Custom’: what Fender have created here is not another reissue with a different livery, it is a ‘reissue’ with mods, which makes it not a reissue at all, and Fender don’t class it as such. The amps of the ‘68 Custom range (there’s a Deluxe and a Twin, as well) all feature as standard some of the key modifications that amp techs and tech–savvy players have been making to Fender amps over the decades to make them better at roles other than classic ‘Fender clean’. My favourite gigging amp is an original 1968 Deluxe Reverb that has an uprated speaker, reduced negative feedback and a small tweak to its tone–stack values, but I’ve been looking out for a Princeton to tweak up in a similar way for smaller gigs and recording. Well, now I don’t need to, because that set of mods is exactly what Fender have incorporated in the models of their ‘68 Custom range! Negative feedback is used to reduce noise and distortion, and also to help keep amplifier circuits stable, but most Fender tube amps are inherently stable anyway, so you can reduce the negative feedback all the way down to zero if you want, in order to benefit from a bit more gain and a more gradual transition into distortion, albeit at the expense of a little more noise. The ‘68 Custom range has significantly reduced negative feedback, seemingly without rendering it at all noisy. The tone circuitry of most mid– to late-’60s Fender amps has an inherent mid–range dip, which is ideal for the classic Fender-clean sound, but small tweaks to the circuit values here can keep more of the mid–range without losing the character. I say small, because it’s easily overdone, in which case you can end up with an amp that sings at high volume but sounds like mud at domestic levels. I think this ‘68 CPR gets it just right — there is more mid–range, but not so much that you lose the essential Fender character. 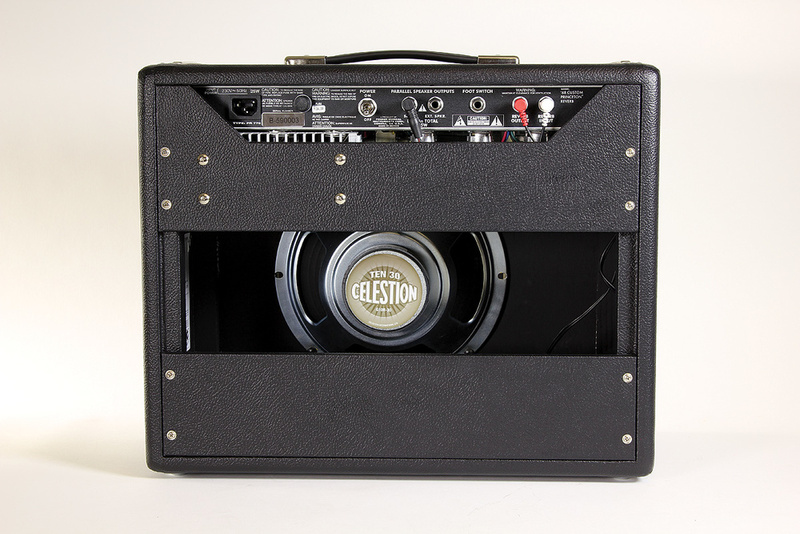 It is a similar tale with the speaker — the Jensens and Oxfords that are renowned for ‘chimey’, sweet Fender clean at lower levels tend to sound ‘flubby’ in the bass and harsh at the top when hit with a loud, distorted signal. Many players swap them out for more robust drivers with better bass handling and a bit more mid-range, and the Celestion G10 that features in the ‘68 Custom ticks both those boxes. The ‘68 Custom series is made in Mexico (the ‘65 reissues are USA–made), but I can see nothing in the build quality that makes this one in any way the worse for it. The baffle is period–correct, in that it is screwed in via battens rather than being an integral part of the cabinet, as in later ‘70s versions. Top–notch Schumacher transformers are used, with three Groove Tubes 12AX7s, a 12AT7 reverb driver and a 6V6 output pair. The rectifier is the period–correct 5AR4 (later models use 5U4). I tried substituting some of my collection of premium NOS Mullards and Brimars, and could make no obvious immediate improvement in performance or noise, so either I got very lucky or the ‘68 Custom tubes get good quality control. The amp as a whole exhibits commendably low noise, both electronic, in the form of hiss and hum, and mechanical, in the shape of sundry rattles and buzzes that often plague small combos. There’s no permanent ‘bright’ capacitor to disable here as Princetons never had them (although that’s another ‘mod’ that has been done for you in the ‘68 Custom Deluxe), so I tended to operate with treble around seven and bass at three for single coils, and eight and two, respectively, for humbuckers. Subtle break–up kicks in around four or five on the volume control, with ever more distortion and power–supply ‘sag’ compression available the higher you go. The pleasant surprise to me is what’s happening below the point of break–up, where this Princeton exhibits warmth and touch-sensitivity in abundance, which is particularly nice for recording in a volume–limited environment. I had wondered whether optimising the amp for louder, more overdriven use might have compromised its other attributes, but on this evidence I certainly wouldn’t say it has. There is a lot of bass anywhere above four on the dial — probably too much for anyone but Jim Campilongo — but there is always enough range to dial it out, and it certainly gives authority to single-note lines played on a bridge single–coil! The long–tank spring reverb does everything that you’d expect of a Fender amp reverb, including offering the usual excess anywhere above about three on the dial. The bias–operated tremolo is also nice — rather than interrupting the signal with a variable resistor at the preamp stage, as a Fender opto–coupler trem does, the Princeton type actually modulates the bias of the output valves. This still achieves cyclic amplitude modulation, but the signal’s rhythmic comings and goings are somehow more subtle and interesting. The ‘68 Custom Princeton Reverb takes drive pedals particularly well, whether they’re mid–hump overdrive types or full–on distortions, and it responds beautifully to a good clean boost pedal if you dial back the bass a little. There’s a saying that “if your band is too loud for a Princeton, your band is too loud” and I wouldn’t dissent from that in this era of decent PA systems and a fairly universal acceptance of miking amps on stage. I had no trouble hearing myself next to a fairly hard–hitting drummer, or even on a smallish open–air concert stage. The extra mid-range certainly helps, and the reduced headroom that this circuit exhibits was never a problem for me on stage, perhaps due to the gradual onset of distortion and the fact that I don’t want my ‘cleaned–up–on–the–volume–control’ sound to be completely clean. There’s a wide sweet spot in which you can ride your volume control to go from ‘characterful clean’ to sustaining lead, but if you want your cleans loud and really clean, you probably don’t want a Princeton — and you certainly don’t want this Princeton. Maybe you should be thinking about a Deluxe, or even a Twin. The circuit tweaks and speaker voicing make the ‘68 Custom slightly darker than a stock Princeton, and while the aim may have been to make this model more pedal–friendly, as a side–effect you get something that’s more effective as a recording amp. Close–miking captures a lot of brittle high frequencies you don’t hear from a normal listening position, but with the highs slightly trimmed back in the source signal, a large–diaphragm capacitor mic at six inches, or even a Shure SM57 tight against the cone will instantly give you a recorded signal far more like the sound you’re used to hearing in the room, which is very handy for the one–room project studio. There are players who love Fender amps as they are, for their palette of classic guitar sounds, and there are those who have grown to love them for what they can be with a bit of tweaking. For the latter, the ‘68 Custom range may be one of the smartest things Fender have ever done. Fender’s ‘65 Princeton Reverb reissue is the obvious choice if you just want classic Fender clean, but a real silverface Princeton Reverb, and many of its boutique clones and even kits, will set you back more than the cost of this ‘68 Custom. Excellent versatile tone platform, either stand-alone or with pedals. 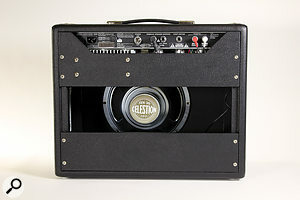 Incorporates some of the best Fender amp mods as standard. Loud enough for live, quiet enough for the studio. It’s PCB–based, so DIY maintenance and further mods will be a little more difficult than with eyelet–board construction. Great tube–distortion tones without being too loud and lovely ‘tube rectifier sag’ compression, in a well-built, affordable package that’s ideal for studio and stage. Fender +1 480 596 9690.